Before I start, I have to say the box art for this "game" is great. I love it. 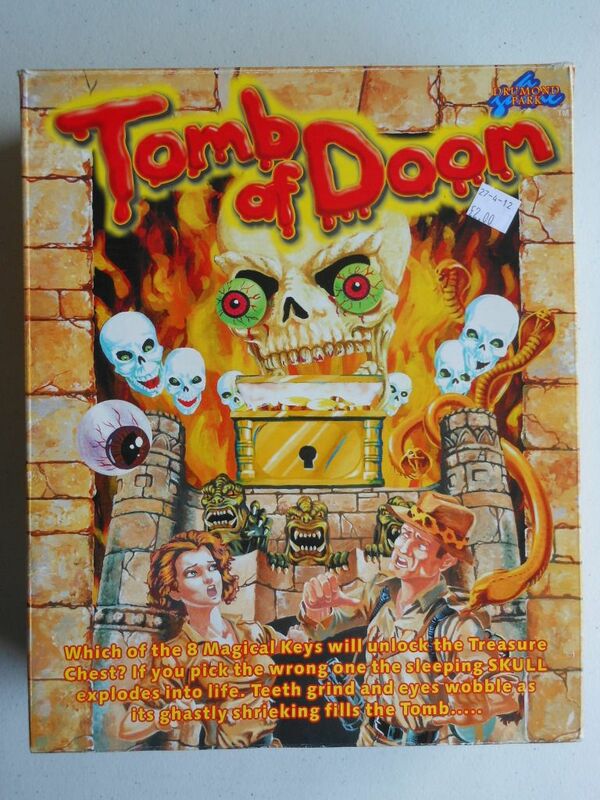 It's a bit retro, and massively over-the-top, with a male and a female adventurer being terrorised by a giant skull, snakes, gargoyles, and a giant eyeball. Top marks. Awesome box art; sub-standard game. 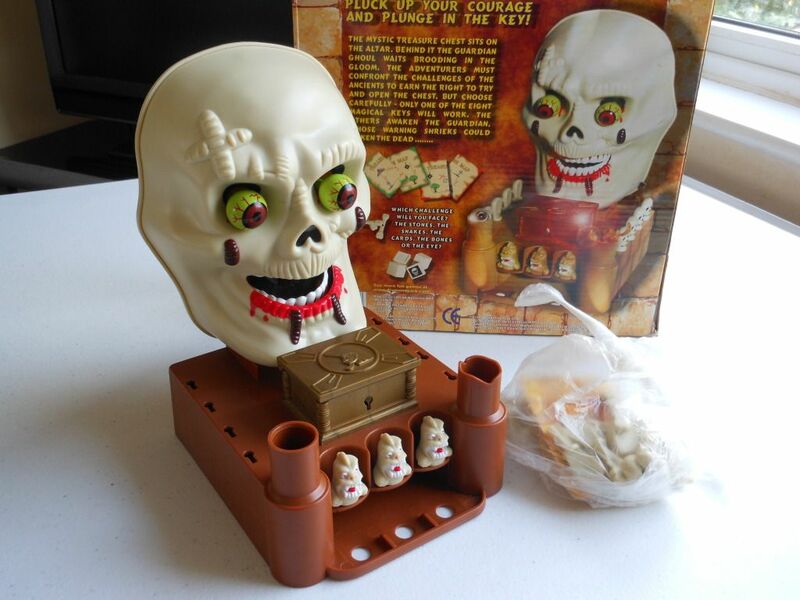 Inside the box there is a large unit that consists of a base and a battery-powered 3D skull. There is no board, no dice... just that weird unit, and some random accessories such as plastic keys, plastic bones and that creepy eyeball from the box art. The "game" is as ridiculous as it looks. The reason there is no board or dice, is because there isn't really much of a game. The basic premise is that there are lots of plastic keys. 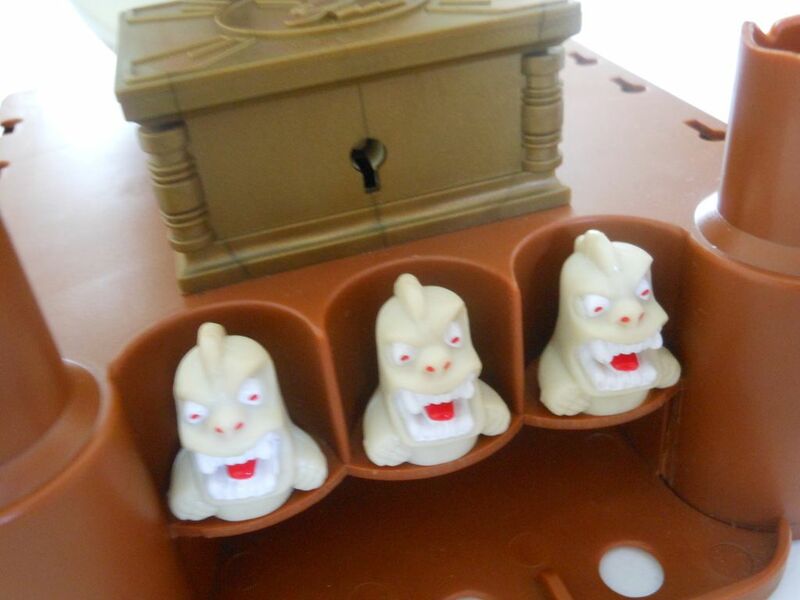 One of them opens the treasure chest that is situated on the base in front of the giant skull, while the other keys will cause the skull to laugh, chatter its teeth, and roll its eyes. You get a chance to select a key by winning a challenge on your turn, which will be determined by drawing the top card from a challenge deck. These challenges are only challenging because they are entirely luck based, and they are not even any fun. One challenge involves selecting one of the three gargoyles on the front of the base and then rolling the eyeball down a ramp. If the eyeball rolls into the slot beneath the gargoyle you picked, then you get to pick a key (and of course, picking the correct key from those available is also entirely luck-based). The only interesting thing about the gargoyle challenge is that the gargoyles were made with the same mould used to make the monster from another board game: Gonna Get Yer! (from Chad Valley). Another challenge involves picking a snake from a pot of snakes. If the snake is the one with a red tail, you get to pick a key. Yet another challenge involves picking one of several face-down cubes. If you pick the one with a skull on it, you get to pick a key. 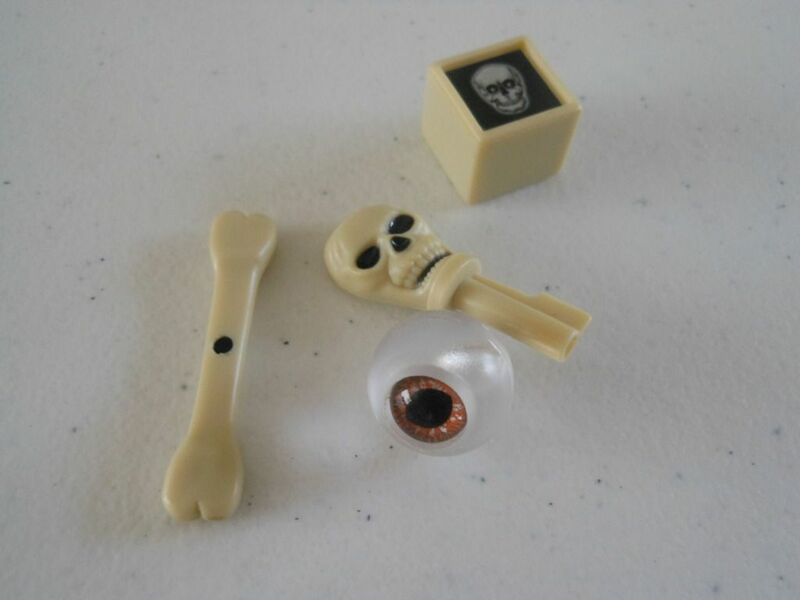 Bone, eyeball, key, and skull cube. But of course, this is a game for children, and the "challenges" are really only there to create a semblance of a game before you get to the cool bit where you pick a key. There is a reason most of the keys will cause the giant skull to wake up: That's the only reason to play with this thing! When the skull activates, it is incredibly noisy, and actually pretty funny. I can certainly see it causing young children to squeal (with excitement or fear, depending on the child), and while this is not going to be the sort of game that will keep anybody interested for long, it should provide a suitably noisy distraction for a brief Halloween treat. 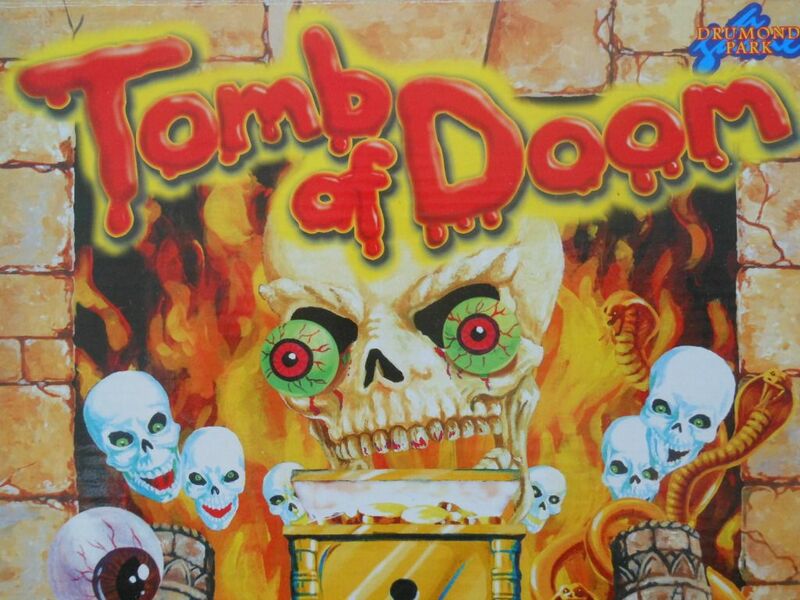 I certainly have no intention of playing Tomb of Doom as designed, but I will be keeping hold of the game and using it as a Halloween decoration. Bringing it out once a year to scare my daughter and her little friends will make it worth keeping. It is a very noisy, and very silly thing. Have fun with it. And thanks for reading.